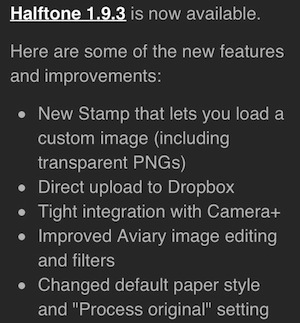 As a reminder, HalfTone is the iPhone app that lets you convert your photos to newsprint dots. You can adjust the quantity and quality of those dots, add caption boxes like cartoons have and change the background ‘papers’. At first glance, my thought had been it was an app that has very limited uses, but places to share the photos keeps coming up. The update has a few items that jump right out as ‘much needed’. The first is the addition to the stamps area, where you can choose an image to use to paste onto your HalfTone converted image. The image stamp can be rotated and resized. 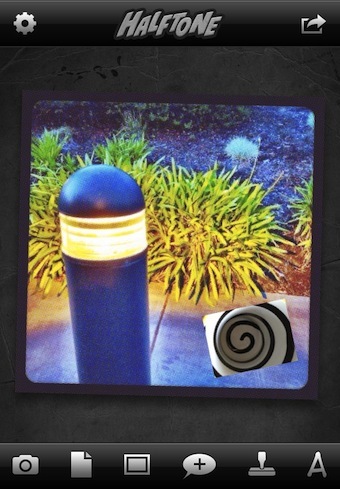 Another item is sending the photos your working on within HalfTone directly out to Camera+. 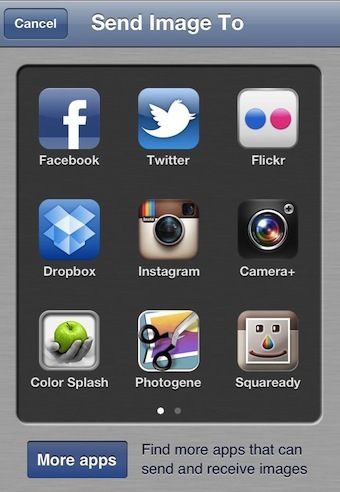 The feature has been available before to send photos directly to other enhancement apps rather than saving to the photo library then importing it to another app. The addition of Camera+ to HalfTone’s Send To options lowers the quantity of steps and number of photos half done on my iPhone.